Heat the oven to 425°F. Stir the granulated sugar, brown sugar and cinnamon in a small bowl. Brush the pears with the lemon juice. Spread the margarine in the bottom of a 10-inch oven-safe skillet. Sprinkle with the sugar mixture. Arrange the pear halves in the skillet, cut-side up, with the tapered end of the pears towards the center of the skillet. Cook over medium heat for 8 minutes or until the sugar mixture is thickened. Remove the skillet from the heat. Unfold the pastry sheet on a lightly floured surface. Roll the pastry sheet into a 13-inch circle. Place the pastry over the pears and tuck the sides in lightly around the pears. Bake for 25 minutes or until the pastry is golden brown. Cool in the skillet on a wire rack for 5 minutes. Carefully invert the tortetta onto a serving plate. Tip: When inverting the tortetta, make sure to use oven mitts and hold the skillet and plate firmly together. 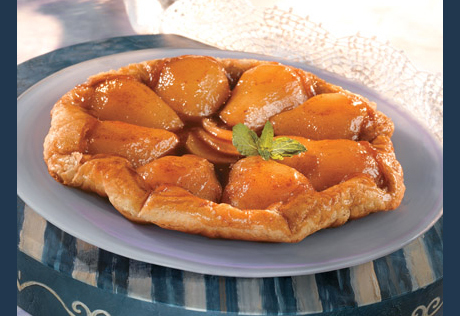 If any pears stick to the skillet, just remove them and arrange them on the tortetta.